Simple have it recycled! We offer curbside pick-up for all types of mattresses, appliances and old exercise equipment at your home or business. Don’t want to leave it on the curb, no problem we will collect it from your house or garage at no extra charge, no need to haul heavy equipment around, let us do the hard work. We collect old washers, dryers, stoves, microwaves, hot water heaters and bicycles to name a few, for a more extensive list of what we recycle. We make it easy by now offering online mattress and appliance recycling scheduling and payment. It is an easy process which takes less than 60 seconds to complete. Don’t wait any longer, schedule online today and forget about it. There may be a freon surcharge fee for appliance such as refrigerators, freezers or air conditioners which contain Freon. What if my mattress got wet? What if my mattress is in bad shape? We understand that people typically recycle a mattress because it is no longer in good shape. So we will accept your mattress in any condition, just as long as it is not wet, in which case we charge an additional $10 for wet mattresses. Your mattress use lots off landfill space, recycling with us is easy and affordable. We recycle many items for FREE but unfortunately we have to charge for hard to recycle items to defer some of the cost. Unlike other companies we will DO accept appliances and anything metal that are broken or in bad shape. We are not picky because we have the means to recycle all of the individual components. Recycling is our job, not merely the reselling of appliances in working condition. This is why we ask a minimal fee to pick-up your appliance: We take on the bigger task of taking appliances apart and recycling all of the material appropriately. Please make use of our 4 EASY STEPS TO RECYCLE if you have items such as mattresses, appliances, or scrap metal to recycle. Simply click on the link above for easy access, or find the steps in our top navigation. How does your appliance recycling program work? We have an easy to follow 4 step process which can be completed in under a minute. Done – After scheduling your recycling (pickup or drop-off) you will be directed to instruction on how and where to drop-off your appliance for recycling. Your receipt and drop-off instructions will also be emailed to you. What other appliances do you accept for recycling? We accept almost all types of household appliances and some commercial machinery. Take a look at the list below. Don’t hesitate to contact us if you are unsure. We accept checks, cash, and all major debit and credit cards, including Visa, Master Card, Discover, and American Express. Tip: Scroll down and enter your zip code for detailed driving directions. Alternatively we can pickup your items for recycling at an additional fee. Please note that all items for recycling needs to be scheduled online before dropping them off at our location (including FREE and Pay to recycle items). Will there be someone to help offload the items. Can I choose a day and time? Yes you can choose a specific recycling pickup day and time during the scheduling process. You will have an option to select the date and time in STEP 4. We offer an easy Curbside Pickup (it does not have to be on the curb). This means that you pay online and leave your item anywhere outside for us to pick it up. Most home owners prefer this arrangement as it is convenient and not intrusive at all. You don’t have to be home, and we don’t have to invade your privacy. We can pick your items up for a fee which will vary according to the distance that our truck needs to travel to pick up your items. We have computerized the process for your convenience. You can find out what a pick-up will cost simply by typing in your zip code. If you don’t want to leave it on the curb or in the driveway then we understand, we can also pickup from inside your house. Click here to schedule a pick up or get a price quote now. Do you pick-up on weekends? We don’t usually do pick-ups on weekends, but it can be arranged under special requests. Please contact us to make arrangements. What if I can’t move my items out to the curb? Don’t want to leave it on the curb? No problem, we will collect it from your house or garage at no extra charge, no need to haul heavy equipment around, let us do the hard work. What if I live in an apartment ? If you live in an apartment building you can leave the small items outside the apartment door, this way we will not invade you privacy when we pickup. What if my items aren’t picked up on the preferred day? Customer service is our highest priority, so we will go out of our way to pick-up your items on the day you’ve requested. However, unforeseen circumstances such as weather conditions, traffic, or work load might prevent us from picking up your items on the day you’ve requested. If this unlikely scenario arise, we will be there the following business day to pick up your items. We will be in touch by email or phone if we are for some reason not able to pick up your items on the day you’ve scheduled. We will pickup your items on the day that you selected during the scheduling process, with exceptions**. It is very hard to judge how long each individual pickup will take as the quantity in each recycling pickup varies a great deal. We also never know when a tuck will have to go back to headquarters to unload if full during recycling pickups. For this reason it is not always possible for us to guarantee that we will be able to pick up your items on the day you requested (99% of all pickups are picked up on the requested day). We will send you an email if we cannot pickup on the day that you scheduled your pickup. Your patience in this respect will be greatly appreciated. Does all the appliances have to be the same type? No the appliances does not all have to be the same type, in other words you still qualify for free recycling and free pickup if you have 5 items which could be any combination such as 1 stove, 1 dishwasher, 2 microwaves, 1 washing machine etc. Click on STEP 1 in the top navigation. It is very easy and takes less then 60 seconds to go through the whole process. You can get an online quote right now, simply by going through Steps 1 to 3 in our online check-out system. If you are not happy with the price you can always call 503-334-4146 to speak to a live person during our normal business hours. I have a storage room or warehouse full of if items to recycle, what do I do? What is the minimum volume to qualify for free recycling? You can get FREE Recycling if you recycle 2 items (depending on the item). Keep in mind that some items we already recycle for free. Paid items will be discounted (the more you recycle the less you pay). The easiest is to simply go through Steps 1 to 4. Discount (up to 100%) will be automatically applied. Who is the volume recycling intended for? 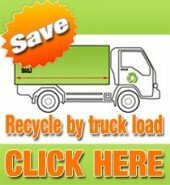 Any business, church, school, or individual who have 2 or more items to recycle. Can I get FREE Printer Recycling? No, unfortunately printers do not qualify for free recycling. However, we do offer discount if you have a few printers that needs to be recycled. Simply schedule the printers to be recycled and discounts will be automatically applied.